1. Department of Pathology, the First Affiliated Hospital, Sun Yat-sen University, Guangzhou 510080, People's Republic of China. 2. Guanghua School and Hospital of Stomatology, Sun Yat-sen University, Guangzhou 510055, People's Republic of China. 3. Guangdong Key Laboratory of Pharmaceutical Functional Genes, MOE Key Laboratory of Gene Function and Regulation, State Key Laboratory for Biocontrol, Department of Biochemistry, School of Life Sciences, Sun Yat-sen University, Guangzhou 510275, People's Republic of China. * The two authors contributed equally to this work. Enhanced glycolysis under normoxic conditions is known as aerobic glycolysis or the Warburg effect and is a hallmark of many tumors. Viral infection may also induce aerobic glycolysis as it is required for replication and survival. Tumor viruses inducing aerobic glycolysis and lactate production during latent infection suggest a potential role of virus-induced glycolysis in tumorigenesis. Virus or virus-encoded proteins regulate glucose uptake and lactate export, increase the activity of glycolytic enzymes, and modulate glucose metabolic signals. Accumulating evidence suggests that virus-induced glycolysis may facilitate cell growth, transformation, migration, and invasion, but its significance in tumorigenesis remains unclear. We summarize the effects of oncogenic viruses on the metabolic shift to aerobic glycolysis and discuss the possible association of this metabolic reprogramming with tumor development and progression. Keywords: metabolic reprogramming, virus-induced glycolysis, aerobic glycolysis, tumorigenesis, oncogenic virus. In glycolysis, a molecule of glucose degrades into two pyruvate molecules. Tumor cells exhibit enhanced glycolysis even when the ambient oxygen supply is sufficient, a phenomenon known as aerobic glycolysis or the Warburg effect. Similar to the process in tumors, viral infections also induce aerobic glycolysis. Many intermediates of the glycolytic pathway are significantly increased following viral infection [1-3], dependent on viral protein expression . Some viruses induce glycolysis for replication . Viruses also use a metabolic shift to counter the reactive oxygen species (ROS) produced by the host in response to virus infection [5, 6]. The mechanism of virus-induced glycolysis is believed to be virus species-specific . Importantly, many viruses, including tumor viruses, induce aerobic glycolysis and lactate production during latent infections [7-9], suggesting a potential role of virus-induced glycolysis in tumorigenesis. We review information on oncogenic virus induction of aerobic glycolysis and the possible association of this metabolic reprogramming with tumor development and progression. Similar to cancer cells, virus-infected cells exhibit increased glycolysis [8, 10, 11]. In addition to infectious diseases, many viruses contribute to the process of cancerogenesis and are known as tumor viruses. Both DNA and RNA viruses exhibit oncogenic potential. Generally, DNA tumor viruses include adenoviruses, herpes viruses, papilloma viruses, and polyomavirus . Accumulating evidence suggests that oncogenic viral proteins contribute to aerobic glycolysis during tumorigenesis, but the underlying mechanisms remain unclear . Some viral genes that facilitate tumor development have been identified . Many viruses have been shown to activate and re-program cell metabolism . Oncogenic viruses contribute to the metabolic effects of cell transformation. Viral oncogenes interact with and regulate a variety of cell signaling pathways and induce metabolic alterations during cell transformation (Table 1) . Current data suggest that viruses either initiate metabolic events contributing to transformation or activate metabolic pathways responsible for tumor progression. Oncogenic viruses or virus-encoded proteins alter host cell metabolism by modifying the expression and activity of glucose transporters and glycolytic enzymes and modulating the function of key signaling molecules involved in glucose metabolism (Fig. 1). Many viruses, including Epstein-Barr virus (EBV), human cytomegalovirus (HCMV), hepatitis B virus (HBV), hepatitis C virus (HCV), herpes simplex virus (HSV), human papilloma virus (HPV), and Kaposi's sarcoma-associated herpesvirus (KSHV) have been shown to reprogram cell metabolism, supporting replication as well as facilitating cancer development and progression. Oncogenic viruses and their regulation of aerobic glycolysis. ALDOC, aldolase C; AV, adenovirus; EBV, Epstein-Barr virus; FGFR1, fibroblast growth factor receptor 1; FSV, Fujinama sarcoma virus; GLUT, glucose transporter; HBc, HBV core protein; HBV, hepatitis B virus; HBx, HBV X protein; HCMV, human cytomegalovirus; HCV, hepatitis C virus; HIF-1α, hypoxia inducible factor-1α; HK2, hexokinase 2; HPV, human papilloma virus; HSV, herpes simplex virus; JCV, John Cunningham virus; KSHV, Kaposi's sarcoma-associated herpesvirus; LANA, latency-associated nuclear antigen; LDH, lactate dehydrogenase; LKB1, liver kinase B1; LMP1, EBV-encoded latent membrane protein 1; MCT, monocarboxylate transporter; MLX, Max-like protein X; PCK1, phosphoenolpyruvate carboxykinase; PDK, pyruvate dehydrogenase kinase; PFK1, 6-phosphofructo-1-kinase; PHDs, prolylhydroxylase; PKM2, pyruvate kinase M2; ROS, reactive oxygen species; VACV, vaccinia virus; VHL, von Hippel-Lindau tumor suppressor; RSV, Rous sarcoma virus; SGLT1, Na+-glucose cotransporter; TALDO1, transaldolase-1. Transport of glucose into the cell is the basis of its metabolism, which controls the glycolytic flux in virus-infected cells. With glucose channeled to the glycolysis pathway, uptake of extracellular glucose must be enhanced to meet the needs of the increased metabolic rate. The expression of glucose transporters, as well as their trafficking to the plasma membrane, influences cell glucose uptake. In early studies, it was demonstrated that infection of cells by Fujinama sarcoma virus (FSV), HIV1, SV40, and polyomavirus promoted expression of glucose transporter 1(GLUT1) and GLUT3 or their membrane trafficking [16-19]. Human papilloma virus E6 expression significantly increases the protein abundance of Na+-glucose cotransporter (SGLT1) in the cell membrane . Overexpression of HPV E6 and E7 in lung cancer cells significantly promotes hypoxia inducible factor-1α (HIF-1α)-mediated expression of GLUT1 . 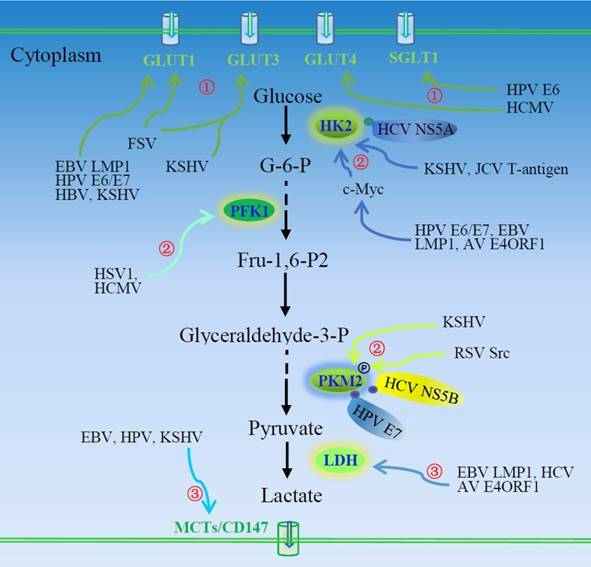 Human cytomegalovirus induces GLUT4 expression, glucose uptake , and consequent glycolysis via activation of 6-phosphofructo-1-kinase (PFK1) [2, 4]. Hepatitis B virus pre-S/S gene mutation increases oncogenic potential , and HBV pre-S2 mutant-induced mTOR activation facilitates the metabolic switch in HBV tumorigenesis. The pre-S2 mutant activates the mTOR/YY1/Myc/GLUT1 signaling cascade. Activation of mTOR signal cascade promotes GLUT1 translocation to the plasma membrane and aerobic glycolysis . Glucose transporter 1 membrane trafficking is also increased in KSHV-infected THP-1 cells . Functional changes in the glucose transport system may be critical to virus-induced oncogenesis. Oncogenic viruses induce aerobic glycolysis. ①Viruses or virus-encoded proteins enhance glucose uptake and consumption via inducing expression of glucose transporters or their plasma membrane trafficking. ②Oncogenic viruses also regulate the expression and activity of three rate-limiting enzymes of the glycolytic pathway, HK2, PFK1, and PKM2. ③Virus-induced LDH activation and MCT expression facilitate the production and secretion of lactate. AV, adenovirus; EBV, Epstein-Barr virus; FSV, Fujinama sarcoma virus; GLUTs, glucose transporters; HBV, hepatitis B virus; HCMV, human cytomegalovirus; HCV, hepatitis C virus; HK2, hexokinase 2; HPV, human papilloma viruses; HSV, herpes simplex virus; JCV, John Cunningham virus; KSHV, Kaposi's sarcoma-associated herpesvirus; LDH, lactate dehydrogenase; LMP1, EBV-encoded latent membrane protein 1; MCT, monocarboxylate transporter; PFK1, 6-phosphofructo-1-kinase; PKM2, pyruvate kinase M2; RSV, Rous sarcoma virus. Epstein-Barr virus causes a number of malignancies including Burkitt's lymphoma and nasopharyngeal carcinoma (NPC). It induces GLUT1 expression  and its translocation [12, 27]. Epstein-Barr virus encoded latent membrane protein 1 (LMP1) exhibits tumorigenic transformation properties. Latent membrane protein 1 activates mTORC1 and subsequent downstream NF-κB signaling, inducing GLUT1 transcription and promoting aerobic glycolysis . Loss of GLUT1 impairs the tumorigenic growth property of LMP1-expressing nasopharyngeal epithelial cells. Latent membrane protein 1 promotes aerobic glycolysis and tumorigenic growth of NPC cells via the mTORC1/NF-κB/GLUT1 pathway, which may provide a target for the therapy of EBV-induced NPC . Kaposi's sarcoma-associated herpesvirus (KSHV) is the etiologic agent of Kaposi's sarcoma (KS), the most common tumor of AIDS patients world-wide. Kaposi's sarcoma-associated herpesvirus-induced metabolic changes are similar to those in tumors . Its latent infection of endothelial cells induces GLUT3 expression and glucose uptake and upregulates glycolytic enzyme hexokinase 2 (HK2), leading to increased lactic acid production. Thus, KSHV infection induces aerobic glycolysis. Inhibition of glycolysis induces apoptosis of KSHV-infected endothelial cells . Aerobic glycolysis is usually essential to rapid growth of tumors; however, under glucose deprivation, KSHV inhibits glycolysis and oxidative phosphorylation, as opposed to inducing glycolysis . This is suggested to act in stress and promote cell survival and transformation . Lactate can regulate dendritic cell activation and antigen presentation, facilitating tumor cell evasion of the immune system [29, 30]. Thus, lactate produced via aerobic glycolysis may be critical to tumor metastasis. Monocarboxylate transporters (MCT) transport lactate into the extracellular environment. Cluster of differentiation 147 (CD147) is required for plasma membrane expression and function of MCT1 and MCT4 . Kaposi's sarcoma-associated herpesvirus or viral latency-associated nuclear antigen (LANA) upregulates the expression of CD147 and induces invasion of primary endothelial cells . Human papilloma virus transfection leads to upregulation of MCT4 and CD147 . Monocarboxylate transporter 4 expression is up-regulated in Burkitt's lymphoma cell lines . It is necessary to investigate the role of enhanced production and export of lactate in virus-associated tumor progression. Many glycolytic enzymes are up-regulated in viral-infected cells, as shown by proteomic profiling . Pyruvate kinase M2 (PKM2) is a predominant isoform of pyruvate kinase in proliferating tumor cells, present as a highly active tetramer and as a dimer with low affinity for phosphoenolpyruvate. The alteration in isoform can regulate the glycolysis. As a rate-limiting enzyme in glycolysis, PKM2 is highly regulated by many viruses: Human papilloma virus E7 can bind to PKM2 in the cytoplasm, inducing structural change from the more active tetramer to the less active dimer [35, 36]. Although inhibiting effects are reported in a few studies, the majority of viruses promote glycolytic enzyme activity. The oncogenic protein Src of Rous sarcoma virus (RSV) can phosphorylate PKM2 and increase its activity [37, 38]. Hexokinase and phosphofructokinase are also phosphorylated in cells infected by RSV . Hypoxia inducible factor-1α promotes the Warburg effect in KSHV-infected endothelial cells by upregulating PKM2 . Lactate production is increased in the KSHV-infected cell in a PKM2-dependent manner. Pyruvate kinase M2 promotes the tumorigenic potential of the KSHV oncogene and the angiogenic potential of infected cells. Hepatitis C virus NS5B, the HCV RNA-dependent RNA polymerase, interacts with PKM2, and PKM2 downregulation inhibits HCV replication, implying a role of PKM2 in metabolism-dependent viral replication . Hexokinase 2 is another critical glycolytic enzyme impacted by oncogenic viruses. Hepatitis viruses modulate glycolysis, showing tumorigenic potential. Woodchuck hepatitis virus-infected cells exhibit enhanced hexokinase activity . Glucose consumption and lactate production is increased in HCV-infected cells. Hepatitis C virus NS5A can interact directly with cellular HK2, the first rate-limiting enzyme of glycolysis, activating HK2 and enhancing glucose consumption and lactate secretion, which may contribute to an increased glycolysis rate during HCV infection . Human papilloma virus16 E6/E7 facilitates the expression of HK2 through elevated c-Myc . Expression of liver kinase B1 (LKB1) reduces HK2 and glycolysis. It is believed that LKB1 retards HPV-stimulated aerobic glycolysis and tumor progression. Liver kinase B1 is inactivated through mutation in many cancer types, including HPV-related cervical cancer . The c-Myc induced-up-regulation of HK2 is required for EBV LMP1-mediated reprogramming of glucose metabolism in NPC cells , and the up-regulation of HK2 facilitates aerobic glycolysis and cell proliferation. Latent membrane protein 1 is the key regulator of EBV-mediated glycolysis in NPC cells. The exogenous overexpression of EBV LMP1 significantly increases glycolysis. Targeting EBV LMP1-mediated glycolysis sensitizes nasopharyngeal carcinoma to radiation therapy . The adenovirus-encoded E4ORF1 binds to c-Myc and induces expression of glycolytic enzymes such as HK2, PFK1, glyceraldehyde-3-phosphate dehydrogenase (GAPDH), and lactate dehydrogenase A (LDHA), promoting glycolysis . The human polyomavirus John Cunningham virus (JCV) T-antigen regulates expression of the glycolytic enzymes HK2 and transaldolase-1 (TALDO1) in medulloblastoma cells . Herpes simplex virus type 1 infection increases glucose uptake and lactate production via PFK1 synthesis and activation . Phosphofructokinase-2 (PFK2) activity and level of fructose 2,6-bisphosphate have been reported to be increased in RSV-infected chick embryo fibroblasts [48, 49]. Hepatitis C virus replication requires host-produced macromolecules, which promotes host cell metabolic reprogramming to aerobic glycolysis mediated in part by increased activity of pyruvate dehydrogenase kinase (PDK), a mitochondrial enzyme that promotes aerobic glycolysis . Several viruses clearly elicit the Warburg effect during viral infection. Some viral oncoproteins modulate the glycolytic pathway in infected cells through interaction with cellular signaling molecules. The regulation of virus and virus-encoded proteins on the HIF-1α. The stability and activity of HIF-1α are regulated by post-translational modifications. HIF-1α is rapidly degraded under normoxia via the VHL-mediated ubiquitin-proteasome pathway. PHD-mediated hydroxylation promotes the association of VHL and HIF-1α. The ROS inhibits PHDs and stabilizes the HIF-1α. The virus and virus-encoded proteins facilitate HIF-1α accumulation under normoxia via disrupting the association of HIF-1α and VHL or PHDs, inducing ROS production, and possible unknown mechanisms. The enhanced HIF-1α potentiates the transcription of GLUTs and glycolytic enzymes and induces aerobic glycolysis. Regulation of viral oncoproteins on HIF-1α transcriptional activity has been well described in Figure 2 of the review paper . EBV, Epstein-Barr virus; GLUTs, glucose transporters; HCV, hepatitis C virus; HIF-1α, hypoxia inducible factor-1α; HK2, hexokinase 2; HPV, human papilloma virus; HSP, heat shock protein; KSHV, Kaposi's sarcoma-associated herpesvirus; PDK, pyruvate dehydrogenase kinase; PHD, prolylhydroxylase; PKM2, pyruvate kinase M2; ROS, reactive oxygen species; VACV, vaccinia virus; VHL, von Hippel-Lindau tumor suppressor. 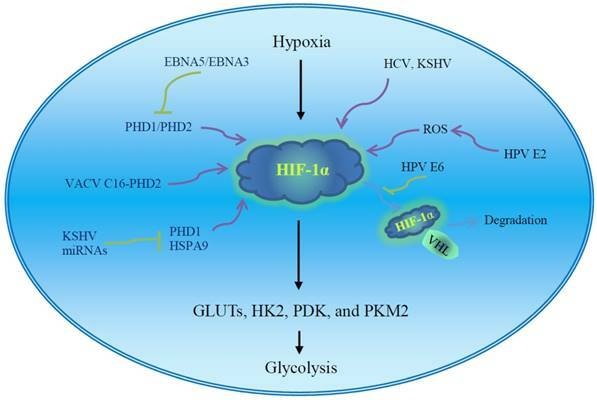 Hypoxia inducible factor-1α is a master regulator of aerobic glycolysis and its role in viral carcinogenesis has been well reviewed . The expression and stability of HIF-1α are influenced by multiple viral proteins (Fig. 2). Human papilloma virus E6 increases cellular HIF-1α level . Human papilloma virus 16 E6 promotes hypoxia-induced Warburg effect through disrupting the association of HIF-1α and von Hippel-Lindau tumor suppressor (VHL), an E3 ligase. The dissociation of HIF-1α from VHL attenuates VHL-mediated HIF-1α ubiquitination and leads to HIF-1α accumulation . Cytoplasmic oncogenic HPV18 E2 localizes to mitochondrial membranes and increases production of mitochondrial ROS, stabilizing HIF-1α and increasing glycolysis . Thus, high-risk HPV E2-mediated Warburg effect or the modification of cell metabolism could play a role in carcinogenesis . Hepatitis C virus infection inhibits oxidative phosphorylation and promotes glycolysis , and HCV proteins induce HIF-1α stabilization under normoxic conditions, which facilitates the expression of glycolytic enzymes such as LDHA and HK1. Hepatitis C virus-associated mitochondrial dysfunction promotes HIF-1α-mediated glycolytic adaptation. This knowledge provides new insight into the pathogenesis of chronic hepatitis C and, possibly, HCV-related hepatocellular carcinoma . The aerobic glycolytic pathway is activated in EBV-infected lymphoblastoid cells. Epstein-Barr virus-encoded nuclear antigen 5 (EBNA5) binds to and inactivates prolylhydroxylase 1 (PHD1) and EBNA3 binds to PHD2, consequently inhibiting hydroxylation and ubiquitination-mediated degradation of HIF-1α and leading to transactivation of aerobic glycolytic genes and production of high levels of lactate and pyruvate . Vaccinia virus (VACV) infection stabilizes HIF-1α and promotes HIF-1α translocation to the nucleus, activating HIF-responsive genes such as vascular endothelial growth factor (VEGF), GLUT1, and PDK1. Vaccinia virus protein C16 directly binds the human oxygen sensing enzyme PHD2 and inhibits PHD2-dependent hydroxylation of HIF-1α . HIF-1α is also significantly increased in the KSHV latent-infected endothelial cells . The p53 tumor suppressor is a critical regulator of glycolysis that down-regulates the expression of glucose transporters and decreases glycolytic metabolism [58, 59]. It is regulated by AMPK in response to metabolic stress. Many viral oncoproteins, including mouse polyomavirus large T-antigen, HPV E6, and EBV nuclear antigen (EBNA) 3C [60-62], regulate the p53 pathway, suggesting that virus oncoprotein-mediated p53 inactivation may enhance glucose uptake and accelerate glycolysis in cancer cells. Virus miRNAs may serve as modulators of glycolysis in infected cells and contribute to tumor progression. miR-34a inhibits glucose consumption and lactate production in cervical cancer cells . Human papilloma virus E6 reduces miR-34a expression, promoting the Warburg effect and consequent progression of cervical cancer . The expression of KSHV miRNA decreases oxygen consumption and increases glucose uptake and lactate secretion, inducing aerobic glycolysis in infected cells . The KSHV miRNAs induce the metabolic switch through targeting PHD1 and mitochondrial heat shock protein HSPA9, leading to stabilization of HIF-1α and reduction of mitochondria biogenesis. The metabolic shift provides a growth advantage in low oxygen conditions, which is critical to the latent viral infection as well as the survival of tumor cells . Epstein-Barr virus LMP1 plays an important role in the pathogenesis of nasopharyngeal carcinoma (NPC). Latent membrane protein 1 induces expression and activation of fibroblast growth factor receptor 1 (FGFR1)  and repression of several Hox genes . Inhibition of FGFR1 signaling attenuates LMP1-mediated aerobic glycolysis and malignant transformation of human nasopharyngeal epithelial cells . Ectopic expression of HoxC8 down-regulates the expression of HK2 and GLUT1 and represses tumor progression in NPC cells . The data indicate that LMP1-mediated metabolic reprogramming contributes to the development and progression of NPC. Chronic HBV infection is associated with hepatocellular carcinoma (HCC). Hepatitis B virus X protein (HBx) stimulates the expression of glucose-6-phosphate dehydrogenase (G6PD) via activation of the transcription factor Nrf2, implying a potential effect of HBV on the reprogramming of glucose metabolism, which may be of importance in the development of HBV-associated hepatocarcinoma . Glucose-6-phosphate dehydrogenase is the first and rate-limiting enzyme in the pentose phosphate pathway. It is highly expressed in chronic HBV-infected human liver and HBV-associated liver cancer. Proteomics and metabolomics studies indicate that HBV core protein (HBc) significantly induces glycolysis in HCC cells. It may recruit Max-like protein X (MLX), a transcription factor, and facilitate its translocation to the nucleus, where it promotes the expression of glycolytic enzymes, such as aldolase C (ALDOC) and phosphoenolpyruvate carboxykinase (PCK1) . In addition, HCV induces glycolysis by activation of HNF4α, a nuclear transcription factor . Infection by KSHV is associated with primary effusion lymphoma (PEL), a unique subset of human B-cell non-Hodgkin lymphoma (B-NHL). Aerobic glycolysis is up-regulated in PEL in a PI3K/Akt-dependent manner . Kaposi's sarcoma-associated herpesvirus K5, a viral E3 ubiquitin ligase, increases aerobic glycolysis and lactate production through alterations in growth factor signaling cascades . It has long been believed that many viruses can induce malignant transformation of cells. The effects of oncogenic viruses on growth signaling pathways have been well studied, but the regulation of viruses and their encoded proteins on cellular metabolism has only begun to attract attention. Glucose metabolism is a main metabolic pathway of cell energy metabolism. Aerobic glycolysis is a hallmark of tumors. Although virus infection may lead to glycolysis, the significance of virus-induced glycolysis in tumorigenesis remains unclear. Obviously, virus-induced glycolysis is more than just a direct cellular response to infection . Many oncogenic viruses induce metabolic alterations similar in most cancer cells, suggesting a role of virus-induced metabolism in cellular oncogenesis . Currently available data demonstrate that viruses potentiate tumor formation and progression through driving expression of oncogenes or reprogramming glucose metabolism via regulation of glucose uptake, glycolytic flux, and energy production. Aerobic glycolysis provides an advantage to virus-associated tumor cells by facilitating growth even under conditions of nutrient and oxygen scarcity. However, the mechanism and significance of virus-mediated glycolysis remain to be elucidated. Currently available data have been mainly generated by studies of transformed cell lines, and interpretation is a challenge. The development of relevant animal models will be valuable in future studies. Understanding virus-induced metabolism reprogramming will aid in developing glycolysis-based therapeutic strategies for oncogenic virus-induced cancers. This study was funded by the National Natural Science Foundation of China (No. 31670788 and No. 81172485), the Ph.D. Program Foundation of Ministry of Education of China (No. 20130171110007), and Open Fund of Guangdong Key Laboratory of Pharmaceutical Functional Genes (No.2014B030301028 and No.2017B030314021). Corresponding authors: Li Yu, Department of Pathology, the First Affiliated Hospital, Sun Yat-sen University, Guangzhou 510080, People's Republic of China. Tel. : 86-20-87755766-8864, Fax: 86-20-87331780, E-mail: yuli5sysu.edu.cn; Shangwu Chen, Department of Biochemistry, School of Life Sciences, Sun Yat-sen University, Guangzhou 510275, People's Republic of China, Tel. : 86-20-39332958, Fax: 86-20-39332950, E-mail: lsschshwsysu.edu.cn.